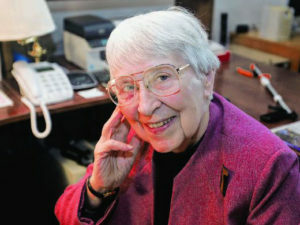 Sister Joel Read, the longtime leader of Alverno College whose vision of placing abilities over grades put her among the nation’s top college innovators, died shortly before midnight Thursday. She was 91. For nearly 35 years, Read led her alma mater on Milwaukee’s south side with warmth, determination and energy. The women’s college was a reflection of her trailblazing approach, but her influence reached far beyond campus. 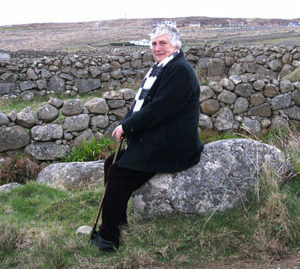 She was involved in local and national academic issues, and had an international network of contacts. In conversation, she was always looking ahead to the next project or advocating for what she saw as the next needed change — often with a charming impatience. 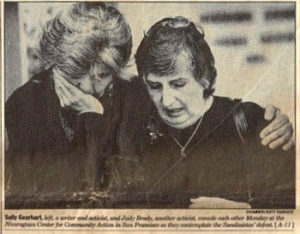 Judith (Judy) Brady, a well known feminist and activist, passed away in San Francisco on May 14th, 2017 at the age of 80, after a brief hospital stay for pneumonia and complications of COPD. She was born in San Francisco in 1937 to parents Mildred Edie and Robert Alexander Brady. She grew up in Berkeley and graduated from Anna Heads high school in 1955. She attended Cooper’s Union in New York and the University of Iowa. She graduated from the University of Iowa with a B.F.A. in 1962. It was in Iowa she met her husband, James Syfers, and they moved to San Francisco in 1963. As a full time housewife and mother of two young daughters, Judy became a prominent figure in the West Coast Women’s Liberation Movement. She wrote the iconic piece “Why I Want A Wife”, which was published in the first edition of MS magazine in 1972 and has been republished countless times in books and textbooks across the country. She was also active in the movement to legalize abortion. 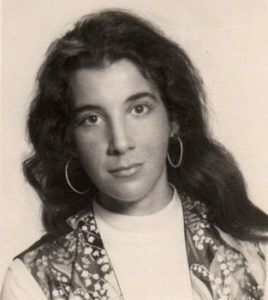 In the early seventies she went to Cuba with the Venceremos Brigade, a deeply meaningful experience for her and she returned to Cuba in later years. In the early 80s she was one of thousands of Americans who traveled to Nicaragua to see its revolution in process. What she experienced in both countries expanded her vision of the possible and deepened her commitment to social and economic justice. Judy eventually divorced and took full time work as a secretary to support her family. She developed breast cancer in her forties and subsequently expanded her activism to the political context and environmental causes of cancer. Her book “1 in 3: Women Confront An Epidemic”, published in 1991, emphasized the root environmental causes of cancer in modern industrial capitalism, rather than blaming the victim as an individual. She was a powerful articulate public speaker and writer and gave many speeches and interviews. She also published many articles, including a regular column “Cashing in on Cancer” for the Woman’s Cancer Resource Center newsletter in Berkeley. 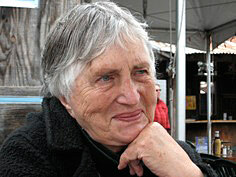 Judy was a co founder on the board of Greenaction for Health and Environmental Justice. She worked with Breast Cancer Action and the Toxics Links Coalition. Judy was a fierce critic of the “cancer industry” and was featured in the film Pink Ribbons, Inc. in 2011, which exposes the hypocrisy and manipulative nature of corporate PR campaigns by polluting industries. Judy had purchased a three flat Victorian in the Mission District in the 1980s along with her close friends Nancy and Judith, and eventually moved to her ground floor flat in 2004. There she became involved in the local community and the fight to resist gentrification. She was a “regular” at water aerobics classes at the Garfield community pool for years and developed treasured friendships. Affectionately known as Ji by her two daughters, Judy was a woman of fierce conviction and strong intellect, as well as great passion for the good fight in all its forms. She well understood the interconnections between all issues of injustice and was involved in many different struggles during her life. Her homes were always open to friends and activists needing a place to stay and her answering machine always included the phrase to leave a message for herself or “anyone who may be staying here”. She loved flowers and gardening, and was also a talented quilter, sewing each quilt entirely by hand and gifting many to friends and family. Judy loved and was loved by her daughters very much, and was a generous and loyal friend to many. Judy is survived by her sister, Joan Brady, her daughters Tanya and Maia Syfers, her grandchildren Alex and Becca Moore, and Lily Syfers, and her nephew Toby Masters. Judy took her place in history and in our hearts and will be greatly missed. A memorial will be held at the Woman’s Building in SF, located at 3543 18th St, on August 27th at 11:30am. In lieu of flowers or gifts, donations can be made to Greenaction for Health and Environmental Justice, or Breast Cancer Action, in San Francisco. The only woman appointed by President Lyndon Johnson in 1965 to the first EEOC, Hernandez has spent a lifetime working to improve the political and economic status of minority groups and women. A native of Brooklyn, NY, she moved to California in 1951 to become an organizer and later education and public relations director for the Pacific Coast Region of the International Ladies Garment Workers Union, where she worked for 11 years. Before accepting the EEOC post, Hernandez was assistant chief of the California Division of Fair Employment Practices. Elected as executive VP at the founding conference of NOW in 1966, Hernandez declined that position but later agreed to serve as VP West, soon after resigning from the EEOC and launching her urban consulting business, Aileen C. Hernandez Associates, in San Francisco in 1967. She has chaired the national advisory committee of NOW, served on the board of NOW LDEF, and co-chaired a NOW task force on minority women and women’s rights. She facilitated sessions at the founding meeting of the NWPC in 1971 and at the 1973 NOW-sponsored International Feminist Conference held in the Boston area. She also founded and was active in Black Women Organized for Action, Bay Area Black Women United, The National Hook-Up of Black Women and Black Women Stirring the Waters. 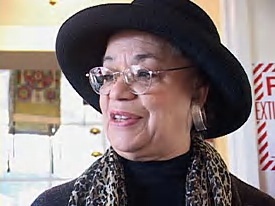 She has served on numerous boards and commissions at national and local levels, including The Urban Institute, National Urban Coalition, Citizens Commission on Civil Rights, Ms. Foundation for Women, Bay Area Urban League, National Advisory Board of the American Civil Liberties Union, African American Agenda Council, and Center for Governmental Studies. She chaired the California Council for the Humanities, the Center for the Common Good, the Coalition for Economic Equity, and the board of the Working Assets Money Market Fund. In 1996, Hernandez helped create and became chair of the California Women’s Agenda, a virtual network of over 600 women’s groups organized to implement the Platform for Action adopted by 189 nations at the Fourth International Conference on Women held in China. Hernandez holds a B.A. from Howard University, an M.A. from California State University at Los Angeles, and an Honorary Doctorate in Humane Letters from Southern Vermont College. Click on button to the right to see previously featured obituaries. A new page will open in a new tab on your browser. Click on VFA tab to return to the page you were on previously.